The State Fair of Virginia opened this week. I scored my family advance “season” passes for just $11 each. It’s normally over $11 just to get in for one day. We have been planning to go this weekend [here’s hoping I feel up to it!]. Funnel cake is out for me, but I am hoping to be able to get some cotton candy and maybe a bit of some ridiculous fried food (thinking maybe Oreo). I’ll probably mainly pack my own snacks though. I am excited to see adorable baby animals. They have an Australian animal show this year, and there’s the always-popular pig races. I also like seeing all the long-haired rabbits and other cuties up for prizes. It seems like they will have a farmers market and a lot of vendors, so hopefully I can pick up something yummy. The rides freak me out a little bit (they seem unsafe), but maybe I will get one a few. I’m sure my brother will want to do rides and games, where I will want to eat, shop and look at animals. 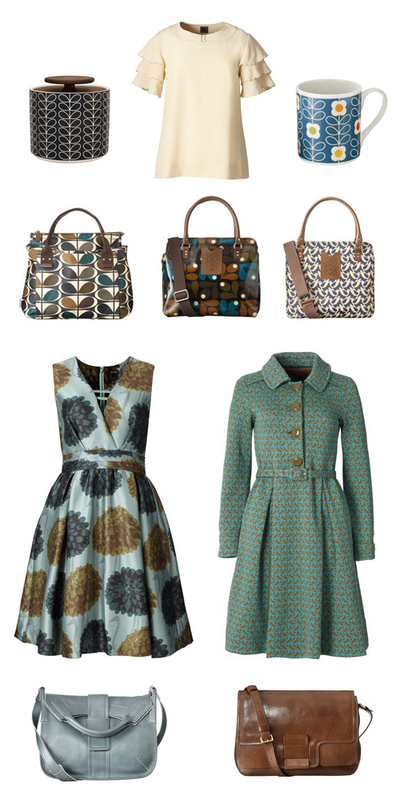 Ever since I heard Orla Kiely was opening her first US location in NYC I have been planning to make a trip up to check it out. I absolutely love her stuff, even though I’ve only bought two Etc line purses (both on sale) and one mainline bag that my parents kindly splurged on for a Christmas gift. I would love the chance to even just try on the clothing, even though that is out of my budget. At least her bags last a long time and are something I can get a lot of use out of (I don’t mind if that don’t always match my outfit). I looked into the discount trains, but I don’t think my personality would do well on a train, plus they don’t save you any time. I found I can take Amtrak for about $100 round trip. I can leave in the early morning, arrive in NYC Penn Station (which is a great hub for the subway) by late morning and then catch a train back that night. That will give be 10-12 hours in NYC and hopefully I can sleep during the train ride, which is about 3.5 hours. I’m bringing my mom with me and she wants to visit the World Trade Center memorial, but that requires tickets that I’m not sure are even available. I’m also hoping to meet up with at least one friend for lunch. I’ve got several friends in that area. I haven’t been to NYC since 2007, and I used to go up multiple times a year, so it will be really nice just to be back.